MASINLOC, Zambales — Fisher folk here on Monday demanded that government officials fight for their right to fish in Scarborough Shoal and drive away the Chinese who have been stealing their catch. “Di pinakikinggan ang ating hinaing. Sinasabihan lang tayo na ‘Cool lang kayo, hwag lalaban.’ Kaya ang mangingisda, tahimik ding uuwi, walang huli,” Leonardo Millanes told Otso Diretso senatorial candidates Gary Alejano, Chel Diokno, Samira Gutoc, and Pilo Hilbay. “Di pa sinusubukan, di na agad kaya. Ang Pangulo, kakampi ng China, hindi tayo,” he said. “Siguro dahil wala pang nagbubuwis ng buhay. Malalaman na atin to (Scarborough Shoal), siguro kung titindig ang gobyerno,” he added. Another fisherman, Leonardo Cuaresma, belied claims that what happens between Filipino fishermen and Chinese is barter. “Pambubully ang nangyayari. Di totoong barter,” he said. Cuaresma practically endorsed the Otso Diretso candidates, who have individually fought for the fishermen’s rights to the traditional fishing grounds off Zambales. “Kaya piliin ang tamang kandidato na makakatulong, lalo na sa lahing Pilipino, piliin kung sino ang sumusuporta para may pagkain sa hapag-kainan ng pamilyang Pilipino,” he said. Maria Risa Pambuad, wife of a fisherman, said the family budget is now not enough with the Chinese control of the Scarborough Shoal. She said candidates who can help needy fishermen and their families survive must be elected to office. “Kailangan natin ito para sa ating mga anak na susunod na magtataguyod ng bansa,” she said. Alejano, Diokno, Gutoc, and Hilbay reiterated their resolve to stand for the right of Filipino fishers to what is also known as Panatag Shoal. “Bakit maamo sila sa dayuhan pero malupit sa kapwa Pilipino? Kayo ang simbolo ng pang-aapi na pinapakita ng dambuhalang China. Tinutulak, binobomba ng tubig. Inapi tayo dati, at hindi nagpagapi. Insulto sa ating mga ninuno kung papalagpasin natin ito,” Alejano said. Diokno has filed a case for the protection of Filipino fishers before the Supreme Court. Gutoc encouraged mothers to join the movement to defend Philippine territory. Hilbay was part of the Philippine legal team that defended the case against China before the international arbitral tribunal. 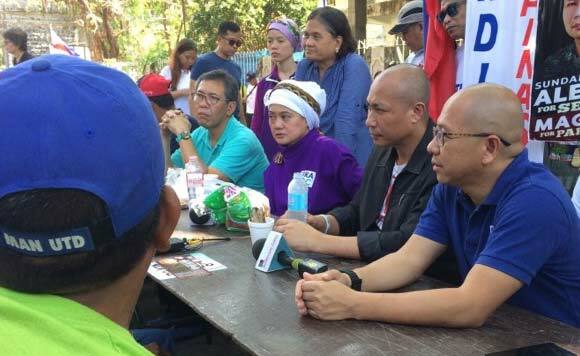 Otso Diretso originally planned to go to Scarborough Shoal and plant a Philippine flag there as a symbolic positive step to the arbitral award granted to the Philippines in 2016. But the Philippine Coast Guard refused to give the boat owners permit if there are recording equipment in the rented boat, and warned that these equipment would be confiscated.